Annual ice skating rink rings in the holiday season. Skaters enjoy the holiday ice rink at the Embarcaderro, which will open on Wednesday. If the weather was not enough of an indicator the scene at the Embarcadero in San Francisco may be. The annual holiday ice skating rink at Four Embarcadero Center is scheduled to open this Wednesday and remain open through Jan. 8. The rink's opening unofficially ushers in the start of the holiday season every year. 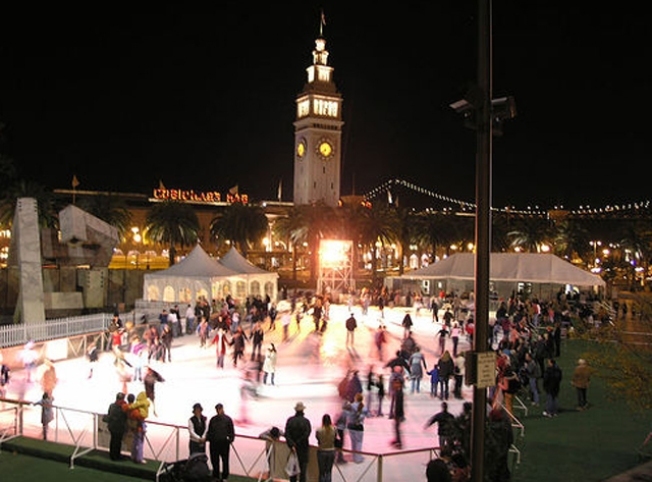 Skaters will be able to enjoy the ice in downtown San Francisco from Sunday through Thursday from 10 a.m. to 10 p.m. and Friday and Saturday from 10 a.m. to 11:30 p.m.
Tickets for adults will cost adults $9 and $5 for seniors and children 10 and under $5.50 on Monday through Friday until 6 p.m.
After 6 p.m. on Friday until closing on Sunday adult tickets will $9.50, seniors and children 10 and under will cost $6.